World leaders flew to Paris to jostle for position at the front of a solidarity rally. Our war mongering, arms selling Prime Minister was there, a man who once ordered the Guardian to destroy hard drives containing information given to them by Edward Snowden - Tom Charles writes. The terrifying events in Paris last week have been pounced upon by the political mainstream and many social media users to declare commitment to freedom of speech and vilify Muslims and Islam. 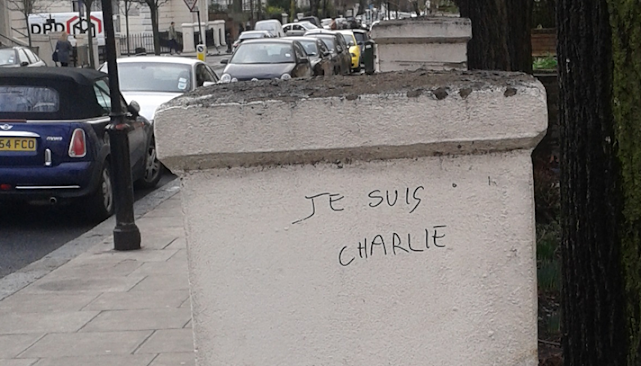 People in Britain have taken to social media to express solidarity with the Charlie Hebdo magazine. ‘Je Suis Charlie’ they say, but had you heard of this magazine before last week? People who have surely never read the magazine are so profoundly moved that not only are they willing to declare sympathy, but en masse have declared that they are in fact Charlie Hebdo. World leaders flew to Paris to jostle for position at the front of a solidarity rally. Our war mongering, arms selling Prime Minister was there, a man who once ordered the Guardian to destroy hard drives containing information given to them by Edward Snowden. And there too was the prima facie war criminal Binyamin Netanyahu, a man with the blood of thousands of Palestinian innocents on his hands, whose own government cracks down on free speech within its own borders and in the territories it occupies. Surreally, along from Netanyahu was Mahmoud Abbas, presumably the most uncomfortable man in Paris that day, marching alongside a man unquestionably responsible for the deaths of over 500 children in Gaza last summer during Israel’s ongoing infanticide. The list goes on and the point is that these leaders are demonstrably indifferent to the sanctity of life and freedom of expression. What they are interested is pushing their own agenda, an agenda of fear and perpetual war that does not benefit the majority of people now proclaiming to ‘be’ Charlie. Charlie Hebdo magazine is part of a mainstream political culture that increasingly seeks to vilify and marginalise Muslims and Islam, failing to provide details of the context in which events take place. The cartoons they published were knowingly offensive and deliberately blasphemous. Why? Political satire should empower the weak and maligned, not target them. To support freedom of expression is one thing, but widespread support for a racist, Islamophobic publication is something else. The right to freedom of speech comes with the responsibility not to deliberately attack, disgust and provoke ordinary people. Muslims are the biggest victims of terror in the world today. Not one government represents a majority Muslim country with any distinction and most are dictatorships that act to shore up American economic ambitions. One of the biggest killers of Muslims is US President Obama, who is in charge of the broadest terror campaign in history; the US drone programme. And the geopolitics of all of this violence affects us here in London. Our politicians, like the murderers in Paris last week have much to gain by dividing us. Both of these groups, who rely on violence for their power and status, are opportunistically seizing on events in Paris to recruit people to their cause and maximise their own power and control. Muslims will be the primary victims of this. Muslims are a minority, an easy target. The mainstream media constantly, daily links two words: ‘Muslim’ and ‘terror’. Slowly but surely these ideas are being internalised and normalised and this is the real threat to our freedom. Islam is a religion of peace and grace, from which we can learn so much about our common humanity. It never has been and never will be our enemy. The real enemy remains those who seek to disseminate violence, terror and division. They have to work tirelessly to divide us. The historical precedents are too obvious to mention; in 2015, let’s make sure we embrace our glorious diversity so that we may know each other, not despise each other. The choice is ours.